The Quiltzette: Check Out Our Class Passes! - Cold & Flu Season - We are here to help you! The median project continues. We will be open our normal hours, Monday-Saturday, 9:00-6:00. Two-hour parking limits on all surrounding streets has been lifted during the project. We apologize for any inconvenience this causes. Please call us if you are bringing in a machine for service - as always, we are more than happy to come out and bring it in for you. As this time of year approaches quickly, we would like to have a plan in place. We have several customers who are going through chemotherapy, or have weakened immune systems. Every winter, we have customers who are sick and take the day off, but come in to the store to grab what they need. (Don't worry, we don't tell!) This year, please call us. We will gather what you need, and deliver to you. Please help us out in this effort. 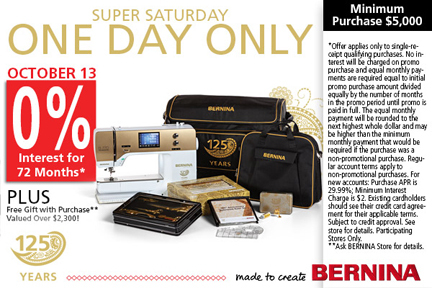 For one day only, BERNINA is offering 72 month financing for purchases of $5000 or more! That is 72 months of 0% interest folks (with approved credit)! 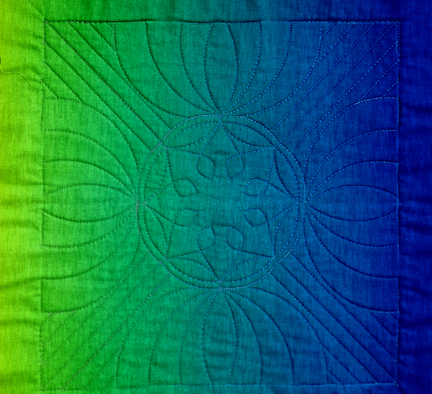 It is not too late to start working on this exquisite quilt! Whether just starting, or for those of you who are ready to move to month two, don't forget to follow along on BERNINA's blog, we all sew. 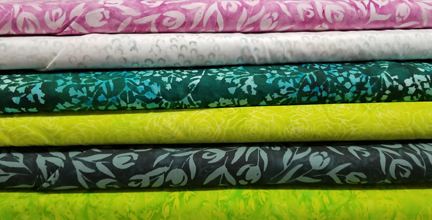 One of the great aspects of purchasing a BERNINA from Cortez Quilt Company and More is that customers receive a set of classes that ensure that they will become knowledgeable about, and proficient with their machine. If you have previously taken mastery classes at Cortez Quilt Company, or elsewhere, and feel as though you don't understand your machine completely and confidently, feel free to sign up for our newly redesigned mastery classes. These classes are split up over the course of several days to ensure that you do not get overwhelmed with everything these amazing machines are capable of. These classes will vary on days and times from one month to the next so that they will accommodate virtually any schedule. You will need to bring in your machine for these classes. 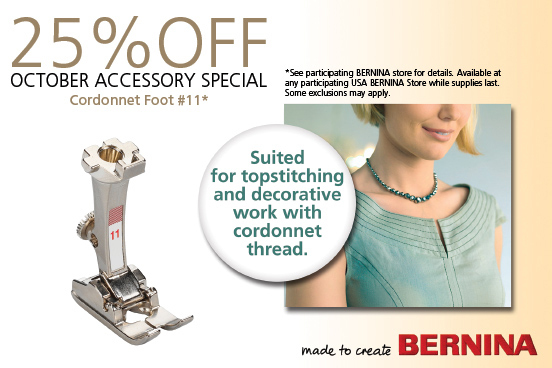 The best part of all (as if becoming a BERNINA master isn't incredible enough) is that these classes are free of charge! If you purchased your machine from us, you will never be charged for a mastery class. If you purchased your machine elsewhere and you coordinate with an already scheduled class, then there is no charge for you, either! Please call to reserve your spot. 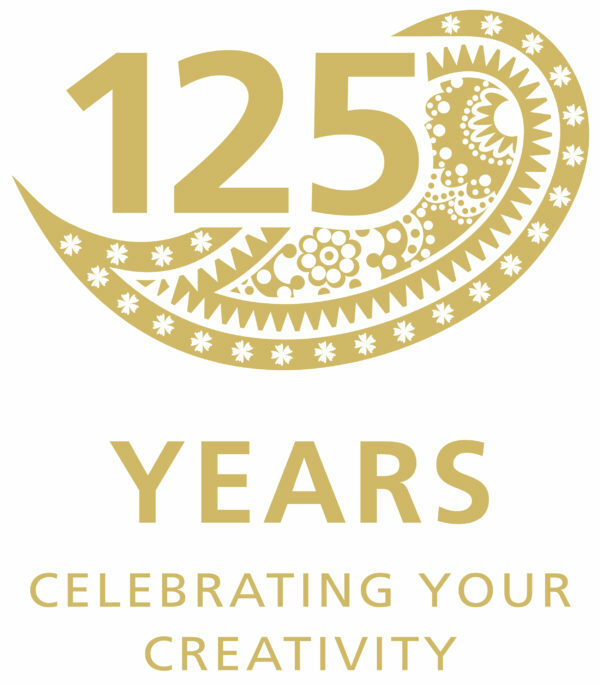 Cortez Quilt Company and More is hosting this big gala to celebrate all things BERNINA! We will have fantastic demos, door prizes, and snacks! You will not want to miss this event! This event is for all of our customers to come celebrate with us. 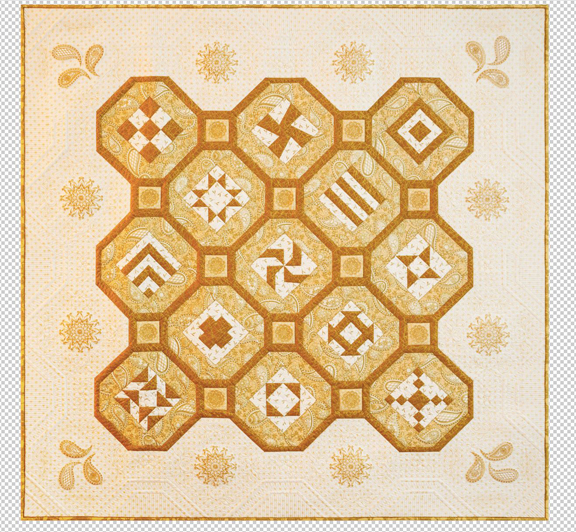 Quilting with rulers is one of the trendiest techniques in the quilting world right now. Sarah has been working hard on a class that we have coming up in January 2019. We will be able to purchase the ruler foot for all makes and models of machines. We can't wait for our sample to be completed, and to start signing customers up for class! New Batiks - need we say more? 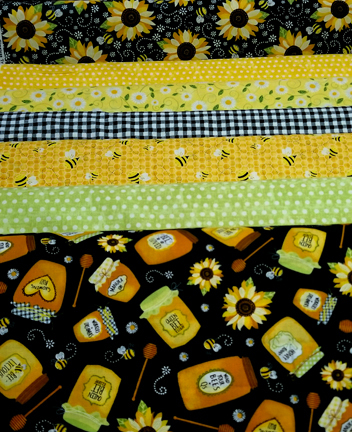 Whimsical bees enjoy daisies and sunflowers in this collection of happy fabrics. Cute jars of honey, yellow or green polka dots, and black/white gingham round out this bright collection. 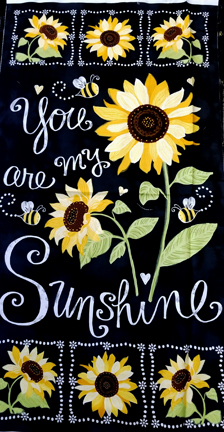 It will not matter what you create with these fabrics - they are sure to brighten someone's day! This table runner is going to look fabulous in your home no matter what fabric is used to create it. This pattern is great at highlighting a fabric collection. Judy will lead this class. 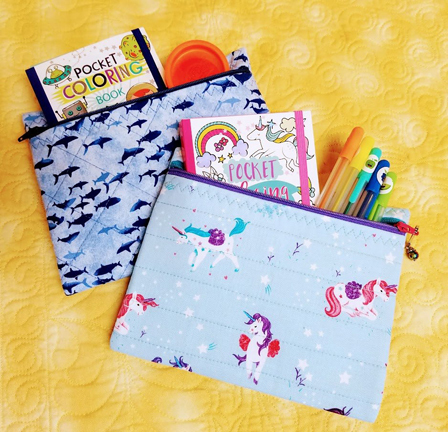 Quick and easy to make, these handy little zippered cases are perfect to store and carry quilting supplies, art supplies, knitting needles, crochet hooks, and lots more. Peggie Buckholtz will teach this class. 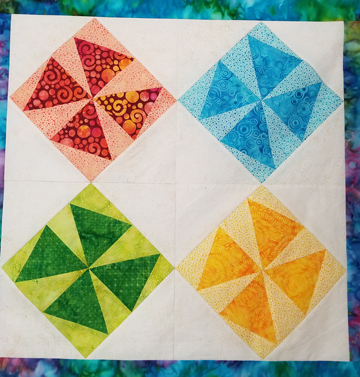 Come learn the technique of foundation paper piecing from Judy! Judy will give you expert tips and advice. This class is a prerequisite to take more advanced paper piecing classes that are coming up. While making a Quick Zip Bag, you will learn simple machine quilting, and how to easily put in a zipper! Come join us for a fun and educational evening out! Bring a friend! Please note the earlier start time for this class. 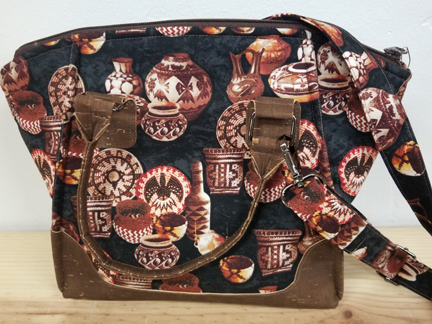 This bag will be beautiful no matter what your fabric choice. Add in the cork accents, and you have a very trendy, up-to-date bag that can go anywhere with you. 3:10 p.m. – 5:30 p.m. 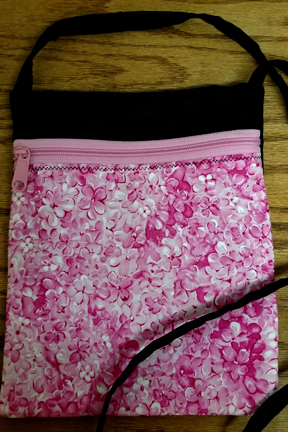 This cute and fashionable bag will be a lot of fun to make, and then take along to all of your activities. Skills learned will include adding a pocket, adding lining, and putting in a zipper. Cassidy will be leading this class. Don't our classes look fun? And you can learn a lot too! We offer a class pass for $69. This pass enables you to take unlimited classes for three months. You can purchase anytime - it is activated when you take your first class. This also makes a great gift to give your friends! (Some classes are excluded from this offer). We have bolts new on the market ordered, so need to make room! 1 yard minimum. Offer expires on Tuesday, October 9, at 6 p.m.You must mention that you saw this offer in the Quiltzette to receive the discount.